Our excretion systems are made in such a way that the liquids and solids are stored separately and leave the body separately. Some eco-toilets toilets make use of this natural separation, keeping the urine and feces separate for separate treatment. 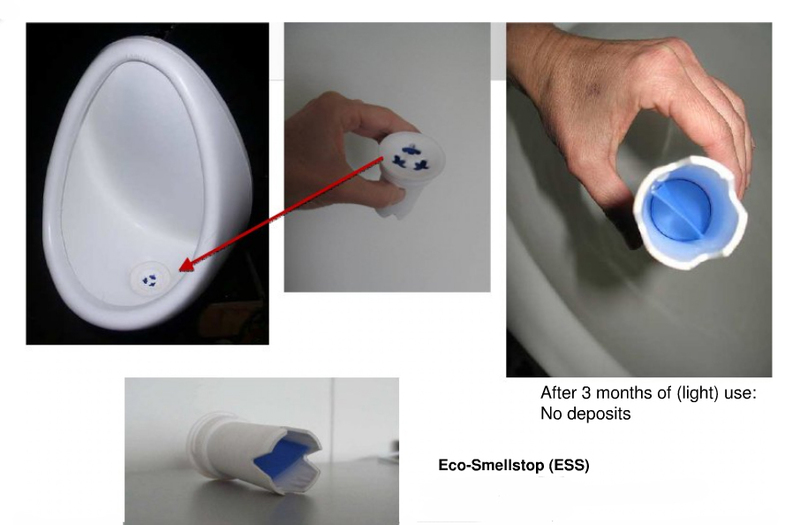 Please read about flushable urine-diverting toilets and waterless urine-diverting toilets for specific product information. Urine contains about 80% of a typical household’s nitrogen output. By diverting the urine, UD toilets keep that nitrogen out of the groundwater, rivers, fresh ponds and estuaries, containing it for reuse. Human urine is also rich in phosphorus, an essential agricultural nutrient that is being depleted worldwide. We envision the development of commercial services that will collect—and even pay for—our “liquid gold”. A healthy person’s urine does not normally contain pathogens, but it can be easily cross-contaminated by traces of feces. Careful handling and storage must be performed to safely recycle urine. Current Massachusetts regulations do not allow home use of urine as a fertilizer. Storage for six months or pasteurization deactivates human pathogens in urine, making it safe to apply to agricultural land. Research conducted by the Rich Earth Institute, in collaboration with the US Environmental Protection Agency, is looking into the best practices for using urine as a fertilizer for hay and forage crops. 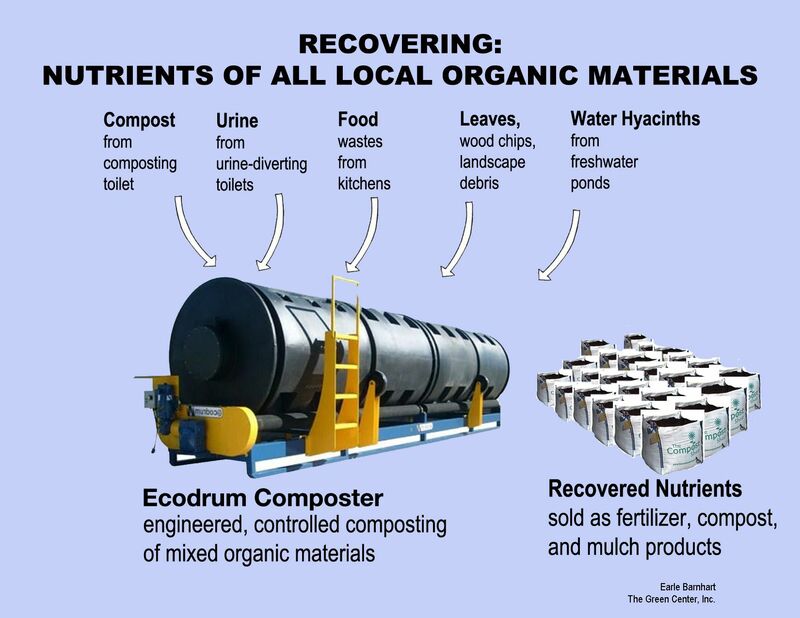 Urine can also be processed with other organic wastes in a closed-vessel composting system such as an Ecodrum. Once finished, it can be used as a safe, organic compost fertilizer. Urine can also be mixed with magnesium oxide to produce pure fertilizer crystals called struvite, which contain 70 to 80% of the nitrogen and up to 90% of the phosphorus found in urine. Struvite is an excellent, slow release plant fertilizer. Its NPK (nitrogen-phosphorus-potassium) value is 6:29:0 and Mg (magnesium) value is 10. Pharmaceuticals or heavy metals, which may be present in the urine, do not precipitate with the struvite. All the potassium remains in the remaining liquid as well as 20-30% of the nitrogen and about 10% of the phosphorus. After deactivating the pathogens through heat or over time, this liquid can be used on the land. It can also be added to carbon-based materials, such as leaves and wood chips, in an Ecodrum. All these forms of nutrients recovered from urine can be used locally for agriculture and landscaping, instead of importing synthetic fertilizers made with petrochemicals and vast amounts of energy. UD toilets are most effective if both women and men sit to urinate. 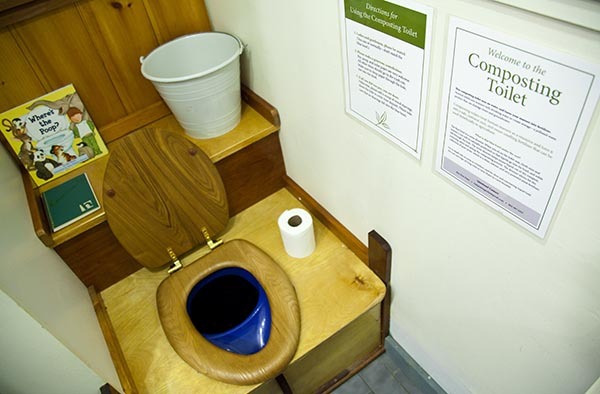 The special urine bowl is smaller than a normal toilet bowl; only by sitting can men be sure to direct their urine into the toilet without splashing – a challenge even with a standard toilet. That being said, many waterless urinals available on the market can also be used to divert urine. 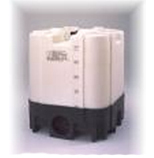 Models range from small, inexpensive fiberglass or plastic units to large ceramic ones. Most are designed for commercial applications, but some are suitable for residential use. 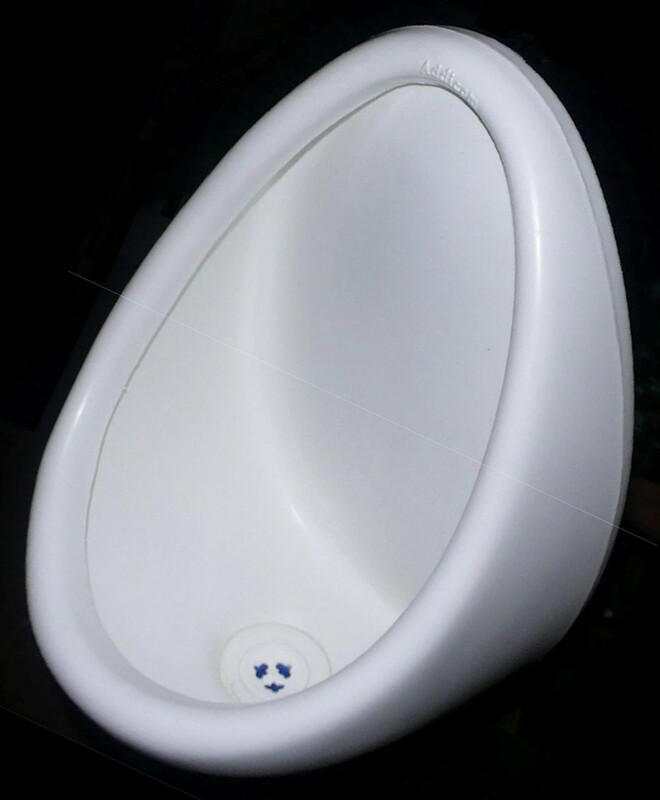 The shape of a urinal determines the amount of splashing, thus the amount of cleaning and maintenance. Bowl-shaped forms produce less splash than other shapes. Well-constructed and well-maintained UD toilets will not develop odors due to the fans that continuously circulate air from the bathroom and out a rooftop vent. Using a sealing device in the drain to prevent odors from the drain pipe. UD toilets use one of several air seals, such as a liquid-trap air seal, a self-closing silicone flap, or a self-cleaning silicon curtain valve. People produce about 90 gallons of urine per year, so the size of the storage tank depends on the size of the household. Once the tank is full, the urine may be pumped out for nutrient recycling. Most tanks are sized for annual removal of the urine. A sensor can notify the homeowner or a septic hauler when the tank is nearly full to arrange a pump-out. UD toilets, like standard toilets, need to be cleaned periodically, just like a standard toilet (please see above). Flushable UD toilets have a separate button for flushing the urine section of the bowl. This will keep the bowl surface clean; however, using water can cause more crystals to form which could clog the plumbing. It will also significantly dilute the urine in the urine tank, which means more pump-outs and less concentration of valuable nutrients per gallon of urine-water mix. The drain from the bowl to the plumbing can be periodically cleaned with a cleaning brush or rod. Separett bio-drain cleaner can also be used to keep pipes clean. The optimal diameter of the urine pipe leading from the bowl is 1 to 1 ¾ inches, connected to a 2-inch pipe leading to the storage container. The gradient of the urine drainpipe to the storage container should be, at minimum, one percent. The drain pipes should be smooth with minimal bends and irregularities.